Ohio State University Extension 4-H Youth Development offers several FUN AND EXCITING opportunities to expand your ATV safety knowledge. This project book is intended for use by individual 4-H members and is appropriate for all age levels. (Youth under age 16 must have adult supervision whenever they are riding.) 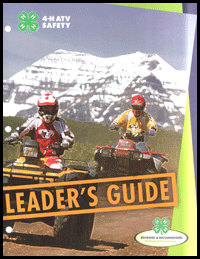 Lessons rely in large part on information from the ATV Safety Institute and are designed to put safety first. The project covers becoming familiar with your ATV, protective gear, riding techniques, safe strategies and safe practices, and respecting the environment. Practice records are also included. Enrollment in an ASI RiderCourse--see below--is recommended but not required. Learn more about this project at Project Central. NOTE: Ohio 4-H does not offer competitive classes for ATV projects at the state fair. Copies of this book and other Ohio State University Extension, 4-H Youth Development publications are available through local OSU Extension offices and online. Ohio Residents get the best price when they order and pick up their purchases through local Extension offices. Part of the Ohio 4-H ATV Safety Training Program, this resource directs leaders on how to implement service learning projects, involve parents in supervision/education of young riders, and much more. Download this resource and the Leader's Guide Teaching Tool Kit Item List. The ASI RiderCourse teaches the correct and safe way to operate and ride an ATV. Conducted by a licensed ATV Safety Institute (ASI) instructor in a controlled environment, this hands-on course offers participants an opportunity to increase their safety knowledge and practice basic riding skills.This half-day course is a great way to get started riding ATVs or to practice correct riding skills. The ATV Safety Institute (ASI) has valued this course at $55 for youth age 15 or younger and $155 per adult. (Prices are subject to change.) If you would like to check on the availability of a course in your area, please go to online.svia.org/Training/ClassFind/CourseFind. The ATV Safety Institute (ASI) offers three age specific e-learning courses to address basic ATV safety principles. Adults, teens, and children learn how to apply the "golden rules" of ATV riding in an interactive setting while enjoying opening comments from Kyle Massey from the hit TV show, Cory in the House. The course includes videos, pictures, and interactive games to make it a fun and effective learning experience for all age groups. After taking the course, users can take an ATV safety exam and receive a certificate of completion. The entire course takes approximately 2-2.5 hours to complete. You can stop at any point and your progress will be saved so that you can return and pick up right where you left off. To enroll in the E-Course, please visit www.atvsafety.org to create an account. It's free, fun and a great learning experience for ATV riders of all ages. "Treadsylvania" is a web-based interactive game designed to help learners ages 8-18 understand how to ride All Terrain Vehicles (ATVs) safely. Treadsylvania isn't your traditional ATV training program, but instead is a fun, visually-appealing adventure game that can be played in short bouts (less than an hour). To play, click here. 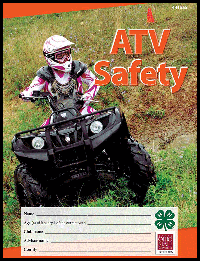 More resources are available from the National 4-H ATV Safety Program.